So I have basically furnished my entire house, and all that's left to do is to accessorize and fill with decor and art. Which is the most fun but also most tediously long part. It can take quite a bit of time to find what you really want, or what you've got in mind for the space. I've decided to work on one room at a time, and actually (finally) share with you some before and afters! We bought a really nice black wrought iron bed for our bedroom, and we also had a lovely bedspread. While we really liked the bedspread, the drama was that since we bought it so late into after it had been released, you could no longer purchase any of the matching throw pillows or european pillowcases for it. Which is turned out to be kind of important if you want the colour scheme to really pop! Adairs is having a sale at the moment, and I'm also a member of their "Linen Lovers" club so I get free postage and discounts on all items. I picked out this bedspread because I really liked it immediately and the colour scheme is pleasant and kind of muted. I've purchased it online and the matching european pillowcases, so now I'm just waiting for it to arrive. 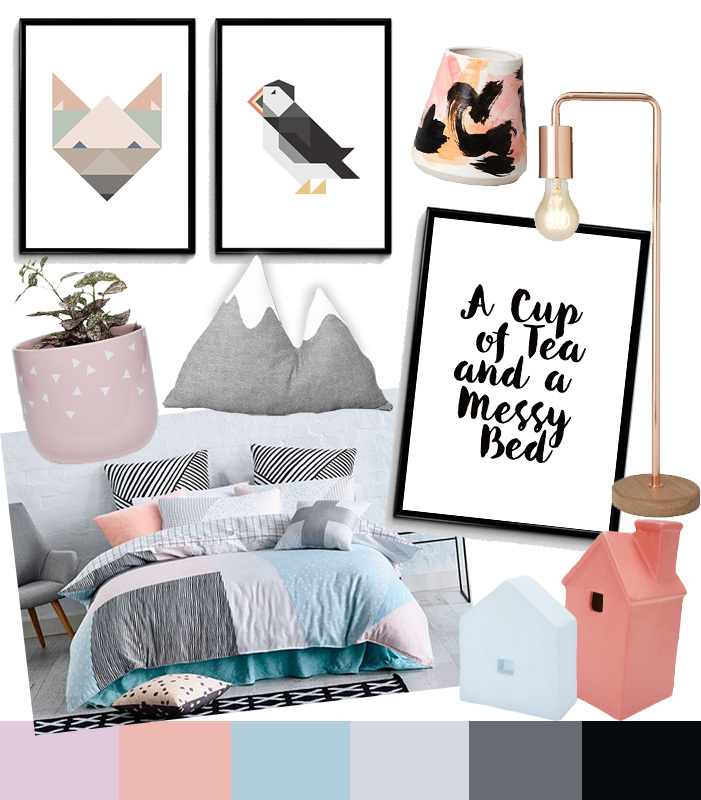 I've used the colour scheme of the duvet cover to create a colour palette and to help pick out more items to decorate the room! Some of these items are a definite and others are there for inspiration/more of a maybe. We're very mish mashed but I love looking at yours! I love decor! My room has a pink theme which is really girly for my age, but do I even care hahaha. Your room looks like it's gonna look amazing! I love the fact that you own this house, so you literally have control over every aspect of the interior design. As for my room, let's just call it a mismatched mess of papers. I really love the colour scheme here, it's cool and also relaxing for a bedroom. Looking forward to seeing some before and after pics! Love these pieces! I also have a rose gold lamp from Freedom, they have some really great piece there at the moment! Love love love love! That adairs cover set is amazing! I love all of these pieces, but especially that lamp!! I love this theme! Its similar to my living room but I have more blue and yellow. I love it all. It is modern, a tad quirky, and colorful. This is so inspiring - I love that fox print! the mountain pillow is so sweet!